Time: 3 hours, add on 2 more if you want to make it up to the ridge and back. Distance: 8 km return from the car park to the lake, add 3 km for the ridge. Elevation Gain: 300 Metres to the Lake, add 350 to 400 for the ridge. Access: You can find this popular trail head at the south end of the Upper Kananaskis Lake day use area. Here there is plenty of parking, toilets and picnic benches. Rawson Lake is a stunning lake offering perfect reflections of the surrounding mountain peaks, the landscape is filled with wild flowers in July and larch trees in September so there isn't really a bad time of year to tackle this hike. Bare (or should I say 'Bear') in mind this is grizzly and cougar territory. Bears are often spotted grazing around the lake side and you can often see evidence of activity on the trail around the lake. Be smart, hike in a group, carry bear spray and check for closures before you head out. The trail starts off along the lake side offering glimpses of the perfect blue water, after a short walk you'll pass Sarrail Falls and head into the woods. 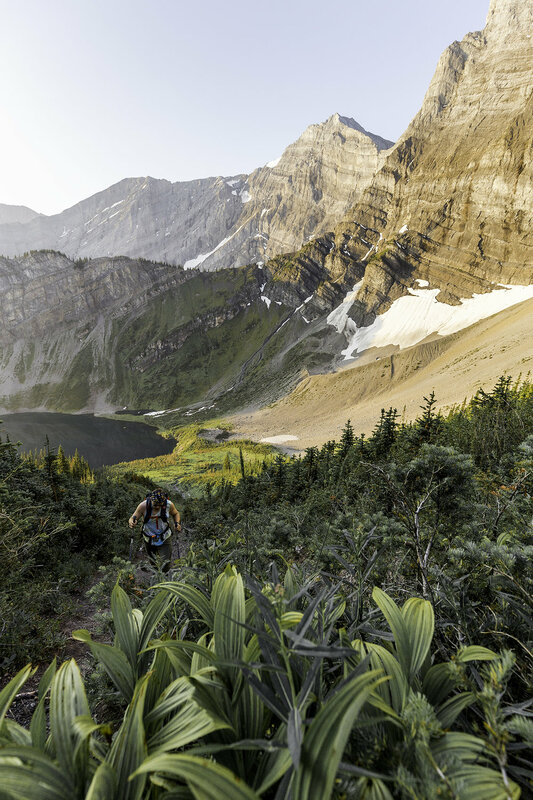 Here the trail starts a steady incline but nothing too strenuous, for very little effort you'll be rewarded with jaw dropping views of Rawson Lake. This trail is relatively well trafficked, especially during the day, as it's a family friendly walk. However if you want to step things up you can make the ascent to Sarrail Ridge. Be warned, this is a view you have to work for! AJ enjoys the views and perfect reflection at Rawson Lake. Tom tackles the early part of the final ascent. It only gets steeper from here! Sarrail Ridge offers some of the best views in Kananaskis Country with sweeping vistas taking in Mount Indefatigable and Upper Kananaskis Lake to name but a few. The incline is steep and relentless, so if you're an inexperienced hiker leave extra time for plenty of breaks. I fell several times on the way down whilst using poles so I wouldn't recommend attempting the incline without them unless you're happy to take a couple of slips! Even though the last part of this hike is tough and tiring we did all agree that the view certainly delivered and you only have to share the summit with a bunch of curious Prairie Dogs. We hiked this trail very early morning to have it to ourselves heading out before the sun came up. The cool morning air also helped make the ascent a little easier, this was our 2nd hike in 24 hours which made the jump into Upper Kananaskis Lake at the end even more refreshing. The final view from the top of Sarrail Ridge, below is Upper and Lower Kananaskis Lake with Mount Idefatigable just opposite.